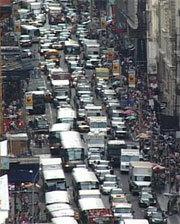 A recent traffic study showed that New York driving is one of the worst driving experiences in the nation. A combination of factors such as higher than average gasoline prices, traffic congestion and lack of available parking all contribute to causing New York drivers a headache every day they get behind the wheel. Fortunately, many New Yorkers have learned to live with these problems and many have worked out ways of making these problems a little more bearable. For instance, those New Yorkers who have a long commute every day know to avoid the roadways most likely to be congested. They know the back roads and shortcuts that can shave a few precious minutes off their trip, or even avoid the most congested areas altogether. There are also a number of free smartphone apps which drivers can use to find the cheapest price for gallon of fuel. Although in many cases what you'd save buying your gasoline for 2 cents less than it is across the street from work is wasted in what it costs you to get there. Parking is another issue completely. There are more than 11 million licensed drivers in the state of New York. New York City has a population of 8 million people, the majority of which are adults of driving age, so finding a place to park in the city, or any where in the state can be a hassle. For many drivers it’s worth the monthly cost for a reserved space in a parking garage or secured parking lot. For drivers who don't need to park for extended periods of time, or on a regular basis, that doesn't make financial sense. Instead these drivers are left to cruise the streets aimlessly in hopes of finding an empty space they can fit into. There are a number of parking spaces labeled and marked specifically for use by persons with a disabled parking permit. If a driver uses that space and doesn't have a disabled parking permit they risk a $50-75 fine for the first offense and a $75-$150 fine for a subsequent offense. Because parking is at a premium in the state parking code enforcement officers are out in force and don't mind writing tickets to drivers who don't follow the rules. That means not parking in disabled parking spaces without a permit, not parking in “no parking” zones and not parking in front of fire hydrants. These are just a few of the driving hassles New Yorkers face every time they slide behind the wheel of their automobile. Defensive drivers know how to prepare for their daily commute, or even just a short hop to the corner market. They take their time, don't get frustrated and always, always, plan ahead before the drive.